Camille Roskelley’s “Retro” block was definitely a lot of fun to make. 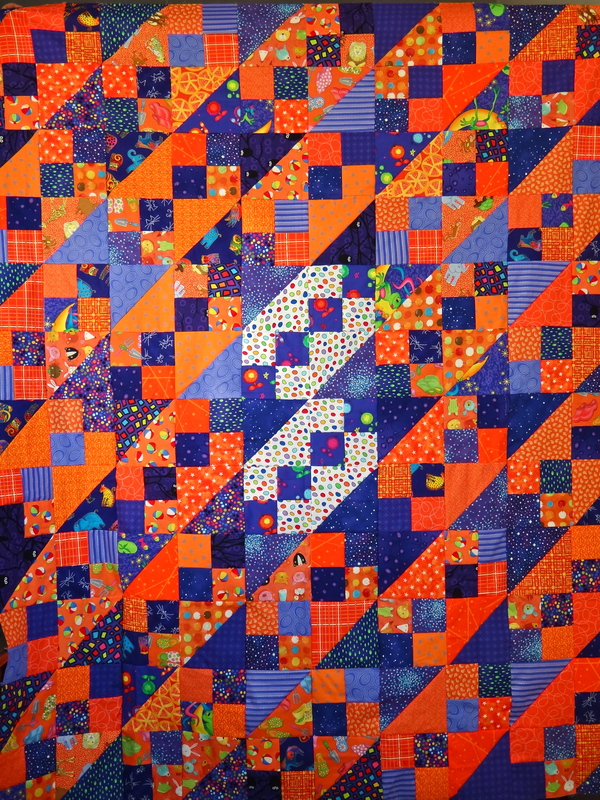 In fact I liked it so much that I made two quilts with that block. 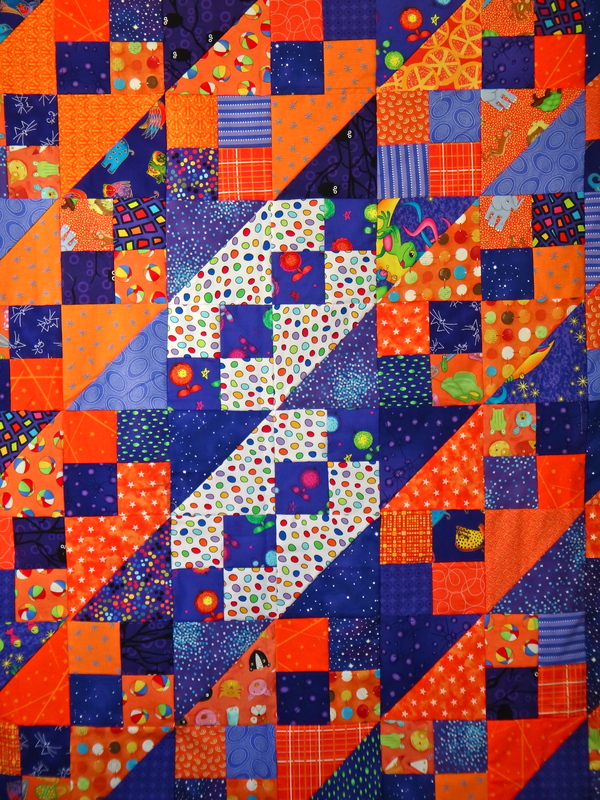 I thought it would be fun to try the quilt in purple and orange. Because the purple and orange were so strong in color, I added the white blocks in the middle to help break it up a bit. 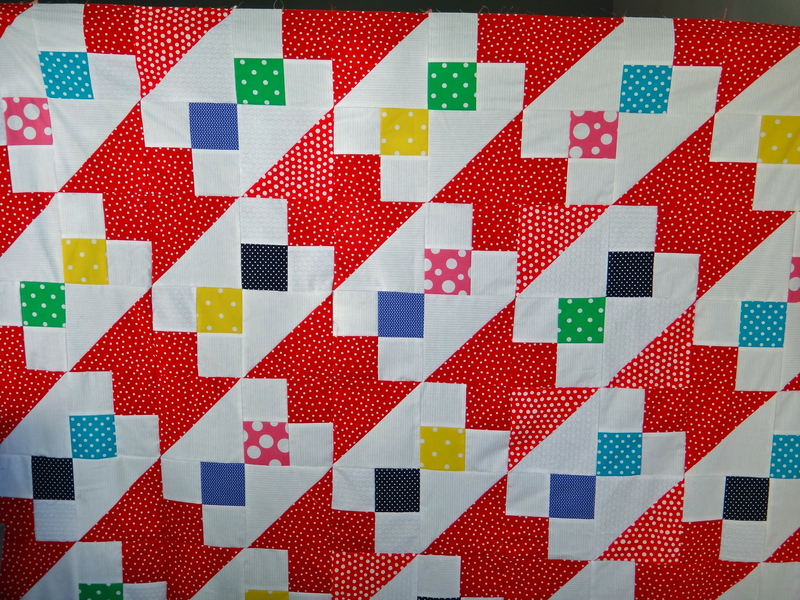 As I was putting this quilt together, I thought that using a red dot and plain white would look really cool too. So after I finished the first quilt, I jumped right into the second one. I chose six other dot fabrics and started cutting. Both quilts came together quickly and I like how they make such a neat pattern. I am looking forward to getting these quilted 🙂 They always look so much better when they have been quilted and bound! As I spread the red one out on my couch to take a look, my puppy Kevin immediately jumped up on it. 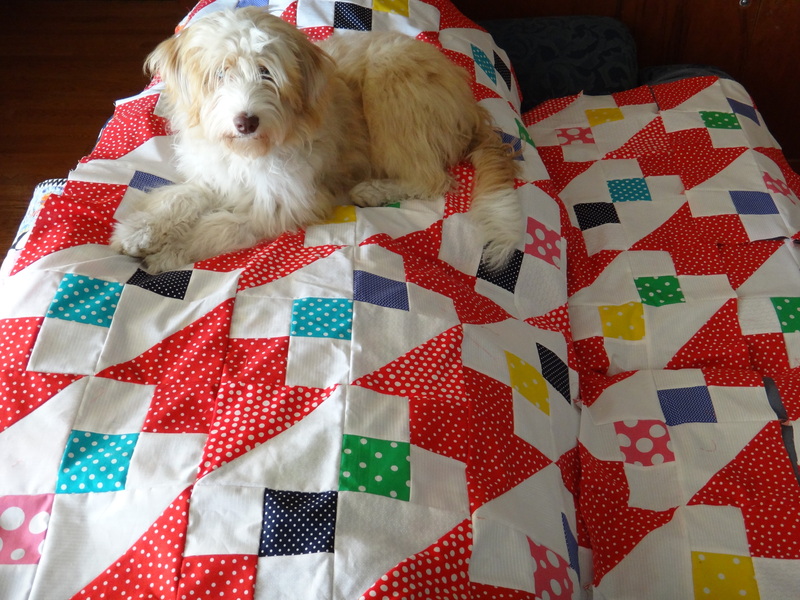 He loves my quilts – tee-hee! Here is the purple one. Mike and Erica thought it looked very Halloween-ish! 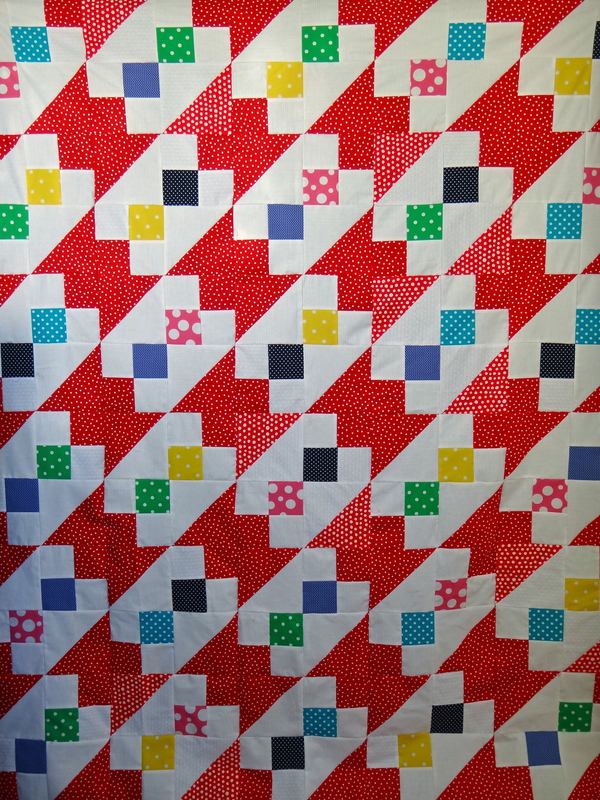 Here is the red dot quilt. I ran out of the red dot fabric toward the end and had to substitute another dot fabric in. I actually like how it turned out. It gives the quilt a little burst of energy. They both look wonderful. I am always fascinated to see how a design comes together and how different it looks when the colours are changed. I can’t say I have a favorite as I like them both. I am in dot heaven with that red one! So cute and playful! I love the quilts. I am a fan of bright colors. I can’t tell you how much you inspire me. I’m pretty new to quilting and I think I’ve found my fountain of inspiration. 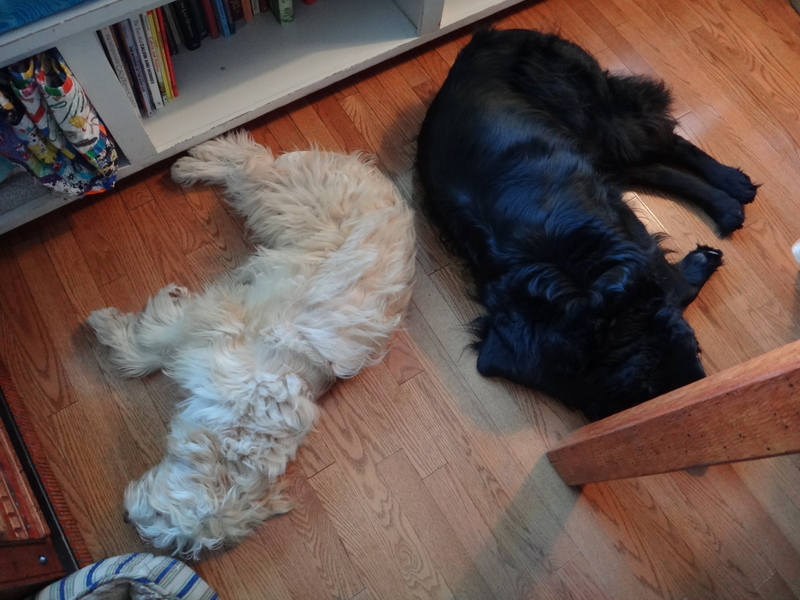 Your pups are adorable. Diana – you are much too kind 🙂 You made my day! Can’t wait to see what you are working on next. I am playing around with some batiks and sailboats. ← Work in Progress Wednesday!